Alkenes are hydrocarbons containing a carbon–carbon double bond. The carbon-carbon double bond doesn't allow any rotation about it, (cis-trans isomerism). Shared electrons in the double bond are called pi electrons and they create a pi bond. The electrons in the pi bond are free to move around anywhere in this shaded region and can move freely from one half to the other. Alkenes are hydrocarbons containing a carbon–carbon double bond. Carbon–carbon double bond is both an important structural unit and an important functional group in organic chemistry. The shape of an organic molecule is influenced by the presence of this bond, and the double bond is the site of most of the chemical reactions that alkenes undergo. Some representative alkenes include isobutylene (an industrial chemical), pinene (a fragrant liquid obtained from pine trees), and farnesene (a naturally occurring alkene with three double bonds). We give alkenes IUPAC names by replacing the -ane ending of the corresponding alkane with -ene. The two simplest alkenes are ethene and propene. Both are also well known by their common names ethylene and propylene. Ethylene is an acceptable synonym for ethene in the IUPAC system. Propylene, isobutylene, and other common names ending in -ylene are not acceptable IUPAC names. This carbon-carbon double bond changes the physicals properties of alkenes. At room temperature, alkenes exist in all three phases, solid, liquids, and gases. Melting and boiling points of alkenes are similar to that of alkanes, however, isomers of cis alkenes have lower melting points than that of trans isomers. Alkenes display a weak dipole-dipole interactions. There is, however, another isomer. But-2-ene also exhibits geometric isomerism. The carbon-carbon double bond doesn't allow any rotation about it. That means that it is possible to have the CH3 groups on either end of the molecule locked either on one side of the molecule or opposite each other. These are called cis-but-2-ene (where the groups are on the same side) or trans-but-2-ene (where they are on opposite sides). Cis-but-2-ene is also known as (Z)-but-2-ene; trans-but-2-ene is also known as (E)-but-2-ene. A cycloalkene or cycloolefin is a type of alkene hydrocarbon which contains a closed ring of carbon atoms, but has no aromatic character. Some cycloalkenes, such as cyclobutene and cyclopentene, can be used as monomers to produce polymer chains. Due to geometrical considerations, smaller cycloalkenes are almost always the cis isomers, and the term cis tends to be omitted from the names. In larger rings (from around 8 atoms), cis–trans isomerism of the double bond may occur. Cyclopropene is destabilized by angle strain. Cyclobutene has, of course, less angle strain than cyclopropene, and the angle strain of cyclopentene, cyclohexene, and higher cycloalkenes is negligible. So far we have represented cycloalkenes by structural formulas in which the double bonds are of the cis configuration. The boiling point of each alkene is very similar to that of the alkane with the same number of carbon atoms. 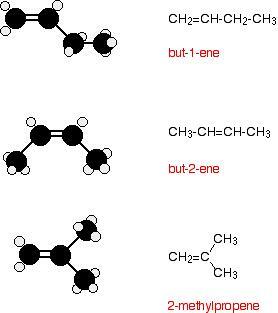 Ethene, propene and the various butenes are gases at room temperature. All the rest that you are likely to come across are liquids. In each case, the alkene has a boiling point which is a small number of degrees lower than the corresponding alkane. The only attractions involved are Van der Waals dispersion forces, and these depend on the shape of the molecule and the number of electrons it contains. Each alkene has 2 fewer electrons than the alkane with the same number of carbons. Alkenes are virtually insoluble in water, but dissolve in organic solvents. The double bond between the carbon atoms is, of course, two pairs of shared electrons. What the diagram doesn't show is that the two pairs aren't the same as each other. One of the pairs of electrons is held on the line between the two carbon nuclei as you would expect, but the other is held above and below the plane of the molecule in a molecular orbital. A molecular orbital is a region of space within the molecule where there is a high probability of finding a particular pair of electrons. In this diagram, the line between the two carbon atoms represents a normal bond - the pair of shared electrons lies in a molecular orbital on the line between the two nuclei where you would expect them to be. This sort of bond is called a sigma bond. The other pair of electrons is found somewhere in the shaded part above and below the plane of the molecule. This bond is called a pi bond. The electrons in the pi bond are free to move around anywhere in this shaded region and can move freely from one half to the other. The pi electrons are not as fully under the control of the carbon nuclei as the electrons in the sigma bond and, because they lie exposed above and below the rest of the molecule, they are relatively open to attack by other things. The rather exposed electrons in the pi bond are particularly open to attack by things which carry some degree of positive charge. These are called electrophiles.